Soldiers in Cameroon shot dead at least eight people during independence protests in the English-speaking parts of the country. Rallies were held on the 56th anniversary of the incorporation of the regions into Cameroon. The mayor of the town of Kumbo said that five of the dead were prisoners shot after a jail caught fire. Activists had called for the release of prisoners who had been arrested in a series of protests over the last year. The divisions in the central African state date back to the post-colonial settlement. The country was unified in 1961 - but English-speakers accuse the Francophone majority of discrimination. The mayor of Kumbo, Donatus Njong Fonyuy, told the BBC the flag of a secessionist movement had been put up in symbolic places in the town. There were several other demonstrations in other parts of English-speaking Cameroon. Demonstrators made a symbolic proclamation of independence as part of their protest, AFP news agency reported. 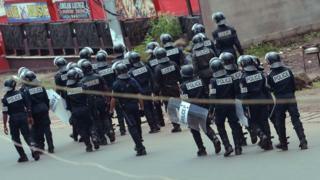 Counter-demonstrations in support of the government and a unified Cameroon also took place in the city of Douala. Earlier in the week, Cameroon banned public meetings and travel in the English-speaking regions. Protests from the English-speaking minority began late last year over concerns they were often excluded from top civil service jobs, and that the French language and legal system have been imposed on them. What started as a movement for greater rights has turned into a demand for independence.